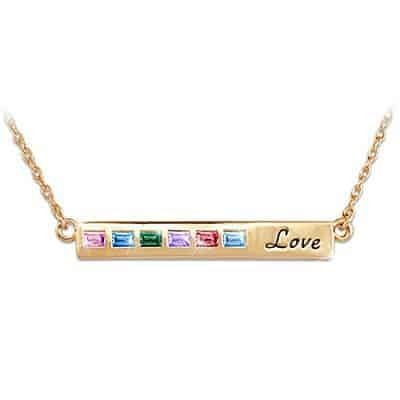 Grandma Birthstone Necklace - 15 Necklaces Grandmother Will Love! 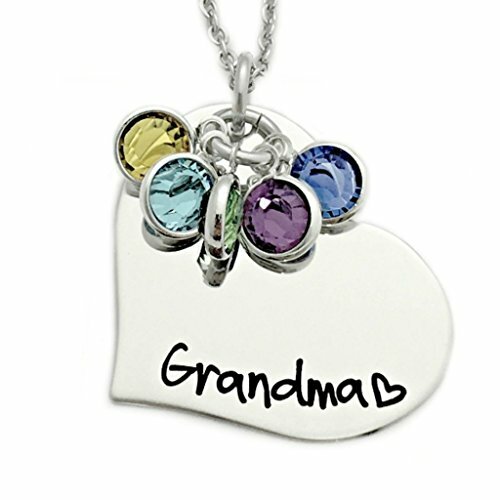 A grandma birthstone necklace is a thoughtful gift from either grandchildren or children. It’s a wonderful way to remind Grandma or Mom how much you love her. 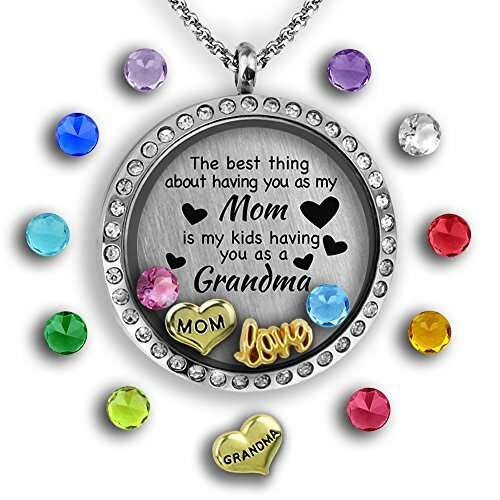 Grandchildren birthstone jewelry is one of the most popular gifts for Mother’s Day, birthday, Christmas, or any special gift-giving occasion. For most grandmas, a truer statement was never made! 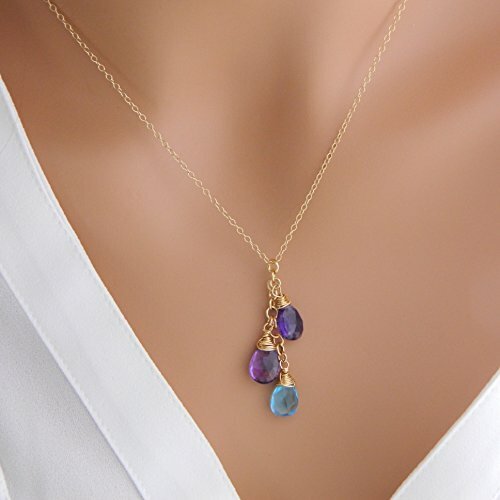 This best-selling Grandma necklace is ideal for the the woman with a large family, as it features up to 15 grandkids ​birthstones on the front. 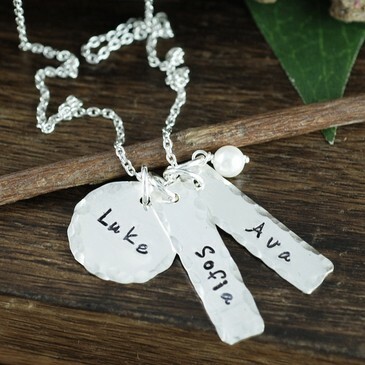 Each of the names is engraved on the back. 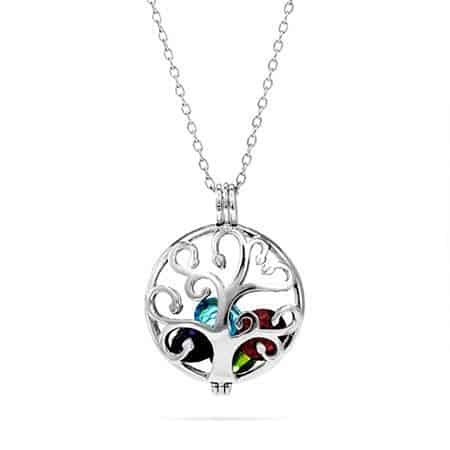 An elegant and unusual twist on the family tree necklace! 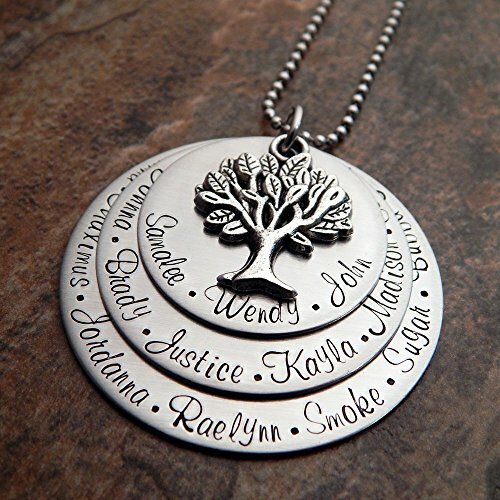 Add up to 7 grandkids’ names, each engraved on their own leaf. 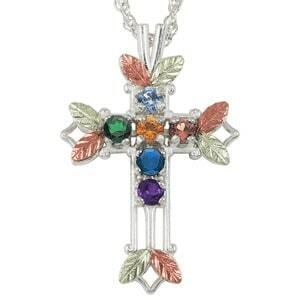 The matching grandkids birthstone dangles gracefully from each leaf. Clear crystals are nestled within the necklace to add just the perfect amount of sparkle. 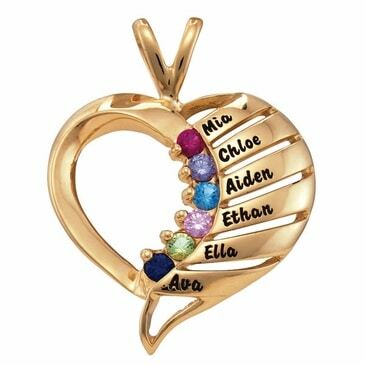 Grandma will be thrilled when you give her this striking contemporary grandchildren necklace that celebrates her family! Up to 5 loved one’s names are engraved on the outer circle. 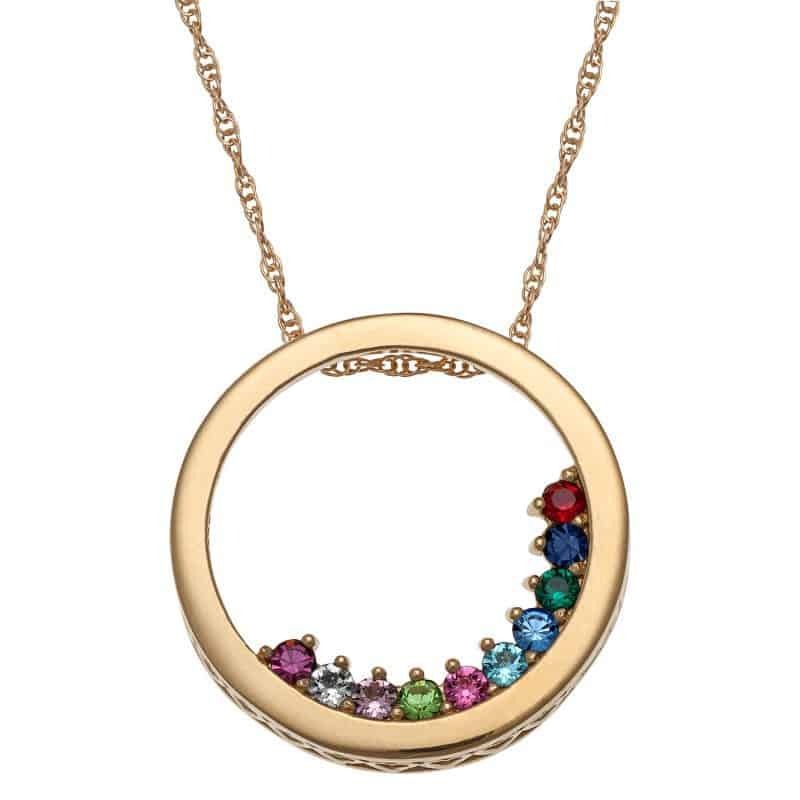 The inner circle features the corresponding Austrian crystal birthstones accented with genuine diamonds. A perfect choice for the grandmother with a lot of grandchildren – or whose family is still growing! 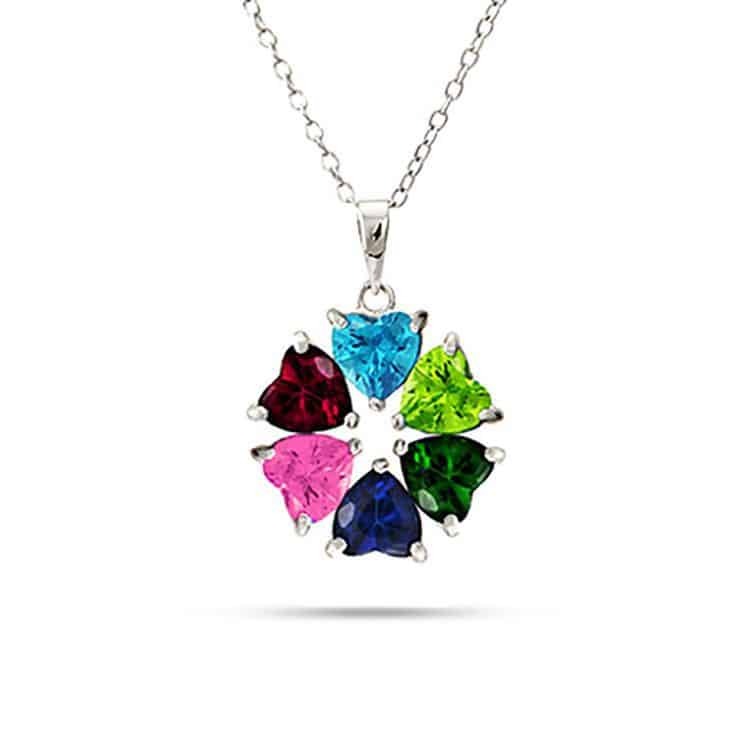 Mix and match the colorful birthstone crystal charms to represent children and grandchildren. 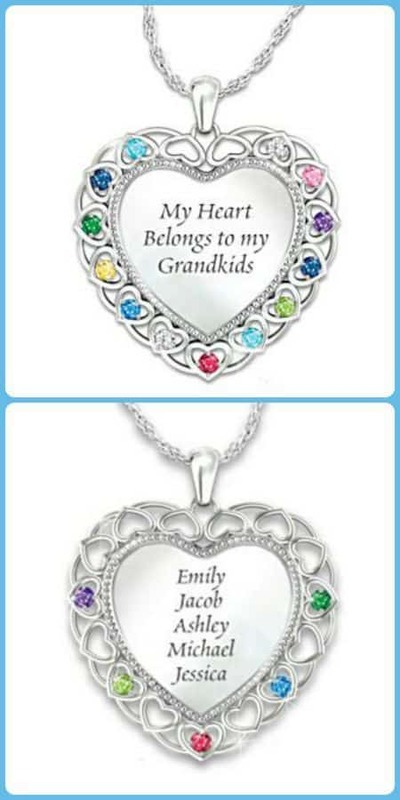 Order as many charms as you need now…then order additional grandchildren necklace charms as you gain new family members. 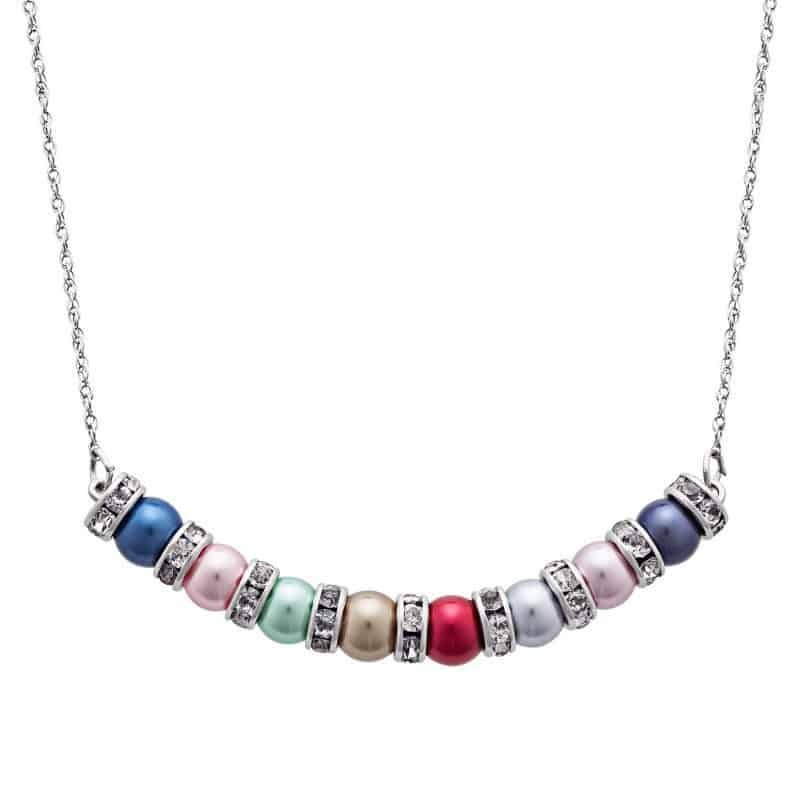 Add up to 14 circle birthstone charms to this festive necklace. You don’t have to spend a fortune to get your grandmother a gift she’ll adore! 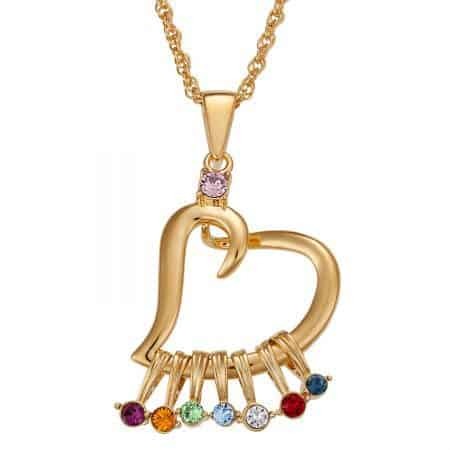 This adorable necklace, priced at under $50, features Grandma’s birthstone at the top of the abstract heart-shaped charm. 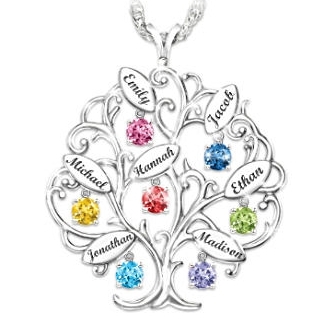 Add up to 9 grandchildren’s Austrian crystal birthstones to the bottom of the charm. The trendy grandmother is sure to appreciate this stylish necklace! 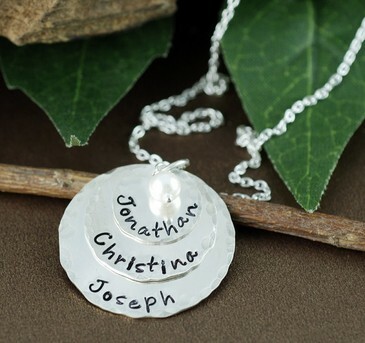 The center disc can be personalized with any title (Nana, Grams, etc), and features an adorable heart. 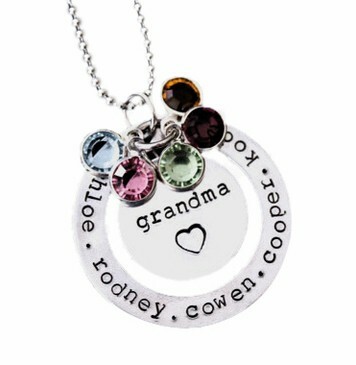 Up to 5 grandkid’s names are engraved on the outer circle. 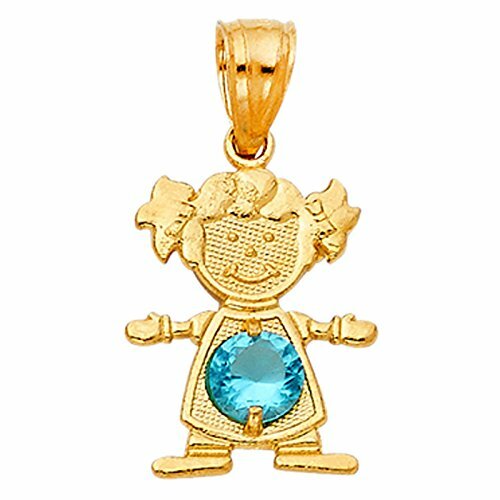 Dangling birthstone charms add just the right amount of sparkle. 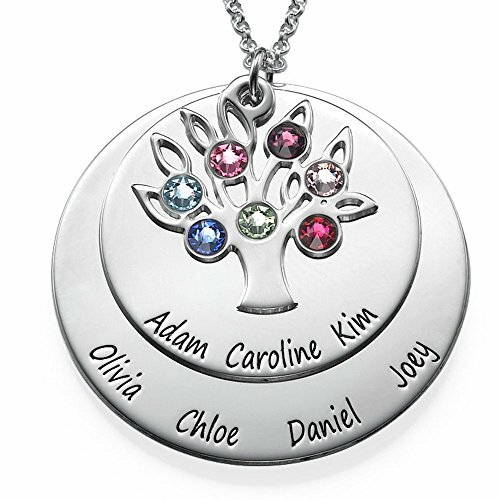 Unique grandkids birthstone necklace features up to 6 moveable roundel pendants, each embellished with a grandchild’s name and adorned with their birthstone. 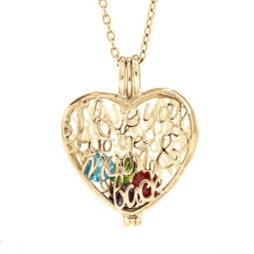 The bottom heart-shaped charm is accented with a glistening Swarovski crystal, and features the word “Love” on one side and the phrase, “My Family, My Joy” on the other. 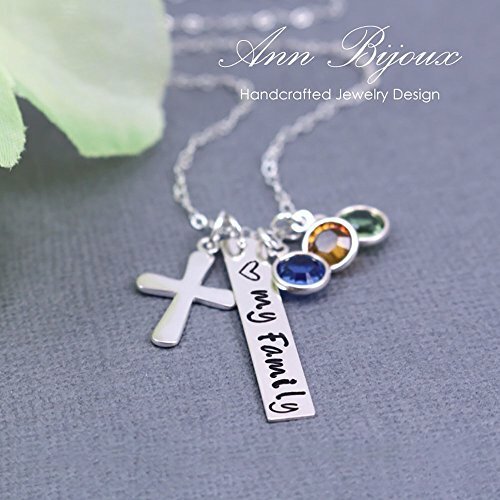 This striking necklace is the perfect way to combine Grandma’s faith with her love of her family! 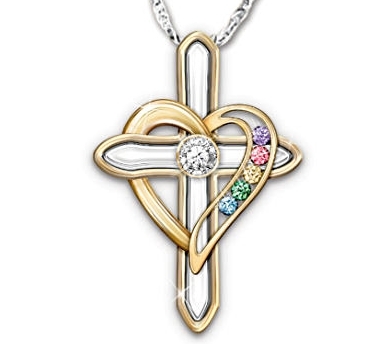 A heart that features up to 6 genuine birthstones is wrapped around a diamond-accented cross. 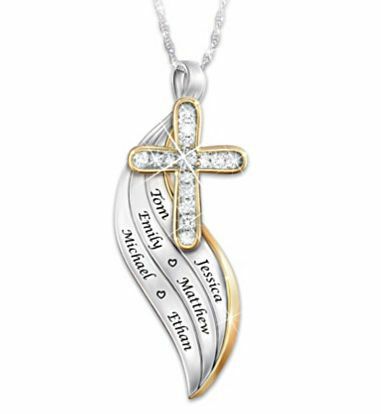 The back is engraved with the touching sentiment: “Faith and Family are the center of a Mother’s Heart“. Lovely contemporary necklace is sure to please the fashionista grandma! 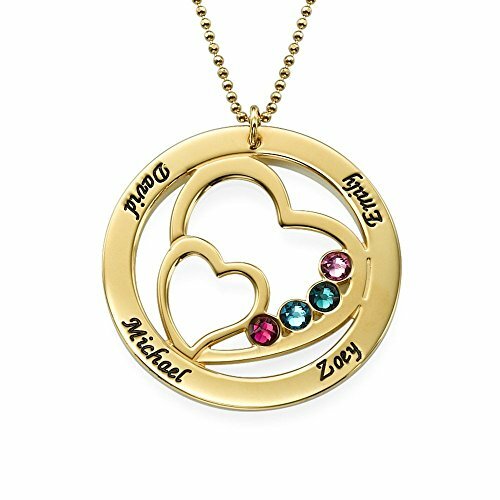 Sterling silver circle features Grandma’s monogram in the center, surrounded the names and birthstones of up to 4 grandkids. Grandma can combine two of today’s most popular styles in one cute necklace! 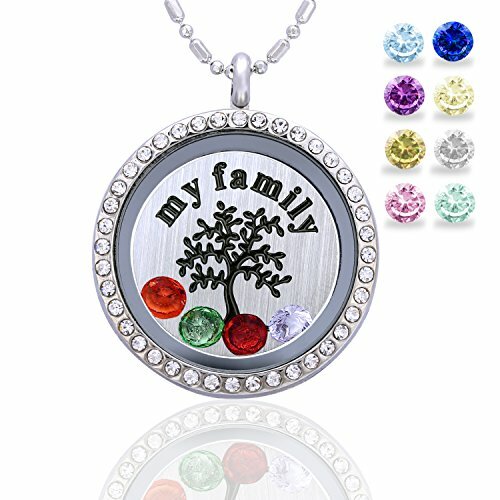 The inner circle creates her family tree using up to 10 birthstones. 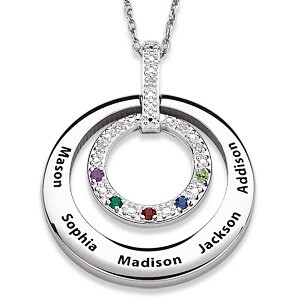 The outer circle, which represents the circle of life, is engraved with each grandchild’s name. 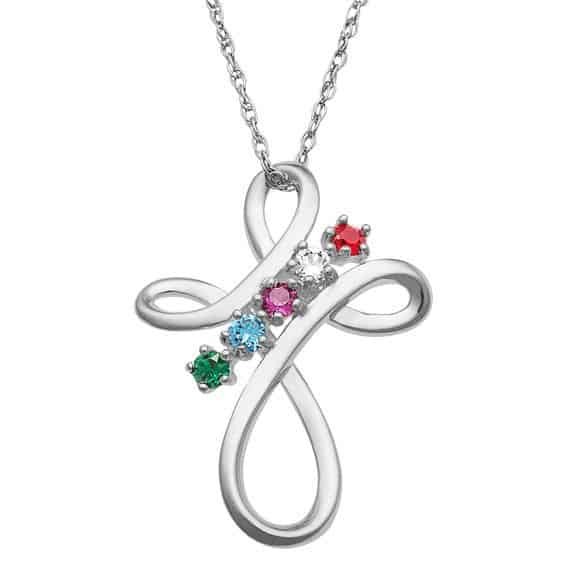 Grandma will treasure this lovely sterling silver and diamond necklace that features up to 6 moving crystal birthstones. “Our Family is held together by Love“. Thrill Grandma with a locket necklace that features her grandkids’ birthstones peeking through the branches of the family tree. 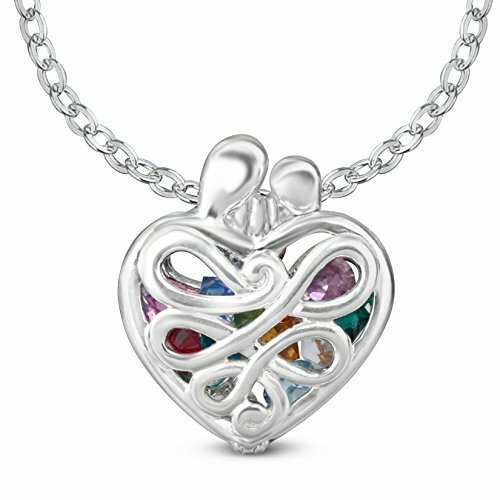 Available in silver or gold, this trendy locket stores up to 8 birthstones. 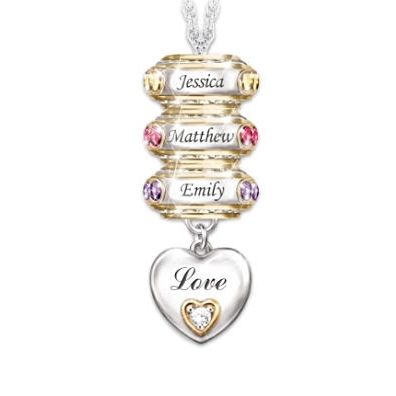 A brilliant and stylish way to celebrate the precious bond she shares with her family! A stylish update to the traditional heart necklace! 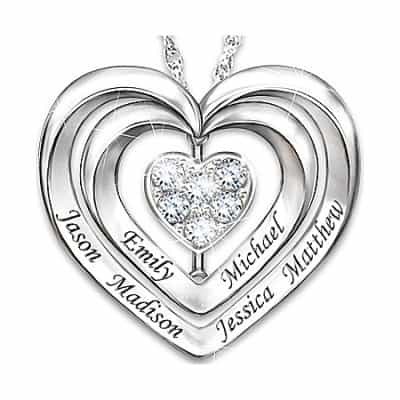 Customize the heart charm with up to 6 names and birthstones. 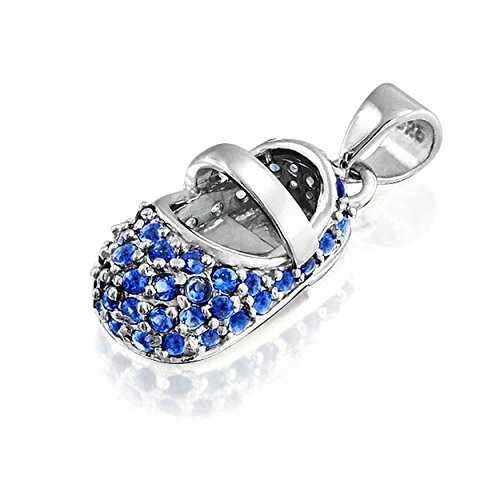 Choose Swarovski crystal birthstones or genuine birthstones. 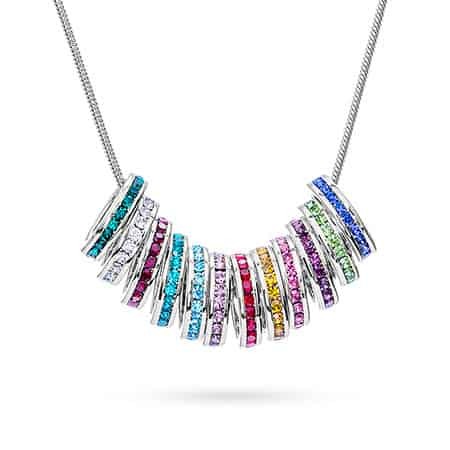 Striking pendant is available in your choice of 10k or 14k yellow or white gold. Click here to see this necklace in sterling silver. 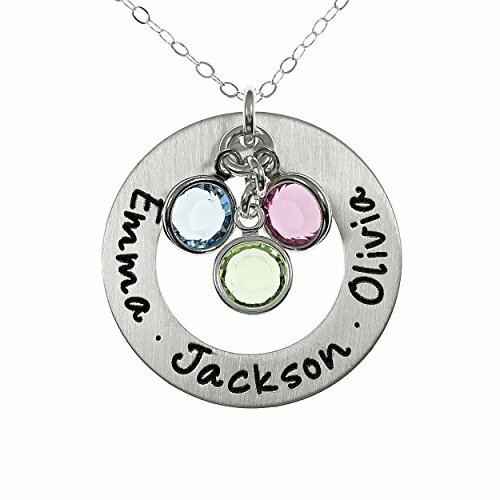 Design your own colorful jewelry with these cheerful grandchildren charms for necklaces. 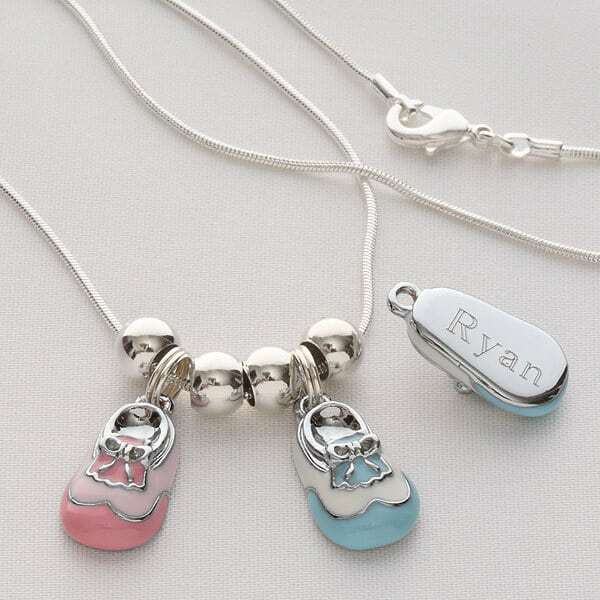 Grandma will be charmed by this darling baby shoe necklace. 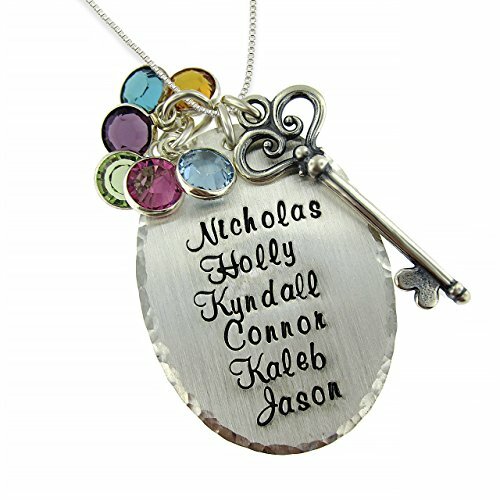 Each charm is personalized with the grandkid's name - the kiddos will love finding "their" charm! 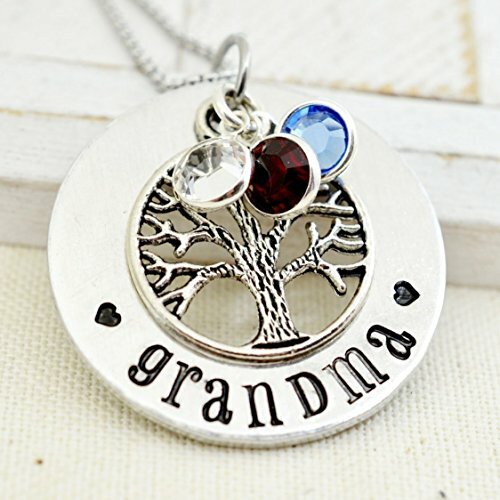 You can add additional charms if more grandchildren are born - perfect for the grandmother whose family is still growing! A unique pendant that’s perfect for the fun-loving grandmother! 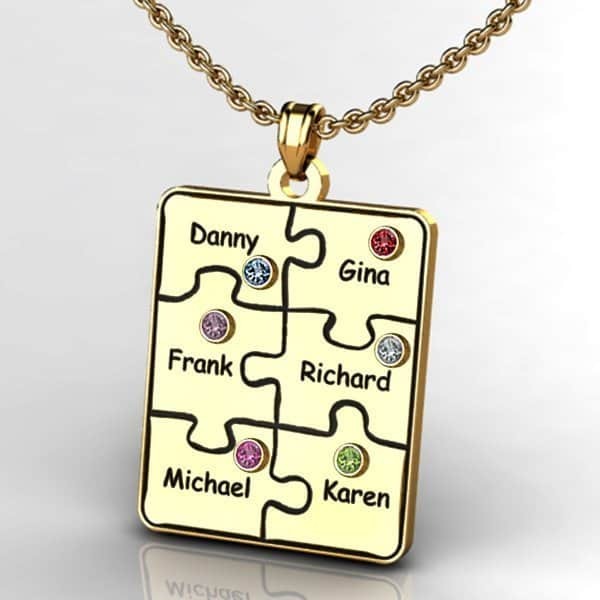 Each family member is represented by a puzzle piece engraved with his or her name. 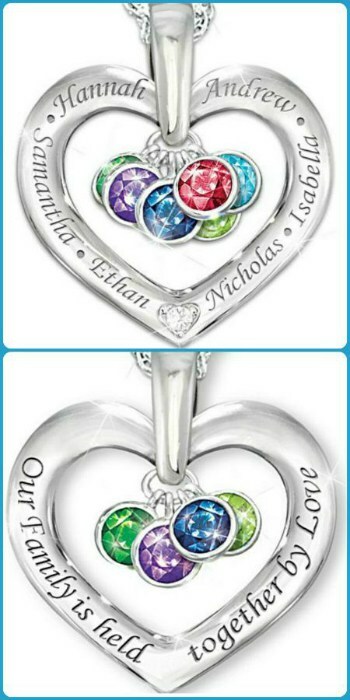 You can add an optional birthstone for each child. The pieces come together to complete the puzzle. Puzzle size and look varies depending upon the number of pieces. Need a last minute gift? This necklace can ship in just one day! No need to shell out a fortune to get your grandmother a lovely personalized necklace – this lovely pendant is priced at just under $50. 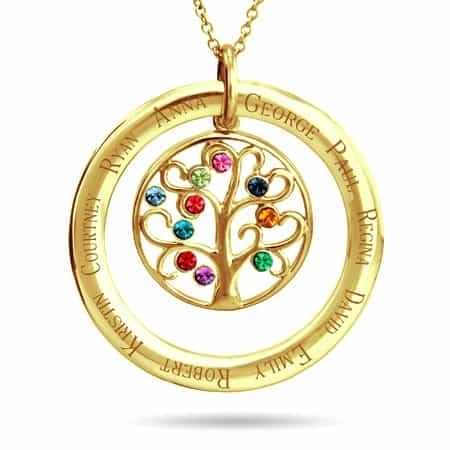 This ornate gold-plated family tree pendant features up to 10 Austrian crystal birthstones nestled within the branches of the tree.